A young mermaid's coming of age is as tumultuous and stormy as any human girl's ... and threatens to destroy her family's security and well-being in The Little Mermaid. Ariel, the little mermaid, is sixteen and is making her musical debut. Her proud father, King Triton, eagerly awaits the moment, as does the court composer, Sebastian Crab. But Ariel is a flighty child, obsessed with the human world above the waves beneath which she lives. And while she's supposed to be preparing for the concert, she's out exploring the ocean floor for human artifacts. When the curtains rise and Ariel isn't there, her father is furious. And all would probably have blown over if it weren't for Ariel's friend Flounder, who lets slip that Ariel was breaking the rules and was up at the surface of the sea. Ariel's father lays down the law, and sets Sebastian as Ariel's custodian. Sebastian tries to curb Ariel's roaming, but he cannot conquer her insatiable curiosity about all things human. When the shadow of a ship catches her attention, she chases it down and looks aboard, becoming captivated by Prince Eric. It's his birthday, and his faithful retainer gives him a ilfe-size statue of himself as a gift. But when a storm blows up suddenly, the ship founders, and only Ariel's intervention saves Eric's life. By the time Eric comes to, the little mermaid has fallen hopelessly in love with him, and her beautiful singing makes Eric fall in love with her. But she is still a little mermaid, and when Eric's retainer and his dog come looking for him, she flees to the sea again. Sebastian has no intention of telling King Triton what Ariel has done, but her behaviour is so altered by her love for Eric that her father notices the change, and asks Sebastian who she's in love with. Sebastian panics and tells him it's a human, and leads him to Ariel's hiding place, where she keeps her collection of human artifacts. Flounder has just brought her the statue of Eric, which sank when his ship did, and Ariel is pretending it's real, flirting with it and teasing about eloping. The outraged Triton confronts his daughter and, when she insists that she loves Eric, decides that he must take drastic action to make her see reason. He uses his special powers to completely destroy her collection, including the statue of Eric. Ariel is devastated. In this vulnerable moment, Ariel is approached by emissaries of the Sea Witch. They tell her that Ursula can solve her problem. At first, Ariel does not want to go with them, but they are sneaky creatures and manage, by calling her attention to Eric and the devastation around her, to convince her that Ursula is her only hope. Ariel swims off with them, and Sebastian and Flounder follow, hoping they can somehow save her. The Sea Witch desperately wants to get her hands on Triton's crown, and she knows she can get to Triton through Ariel. She convinces Ariel to sign a contract that will give Ariel human form for three days. If, in that time, Ariel can get Eric to kiss her, then Ariel will remain human forever. If, however, she fails, then she becomes the property of the Sea Witch. 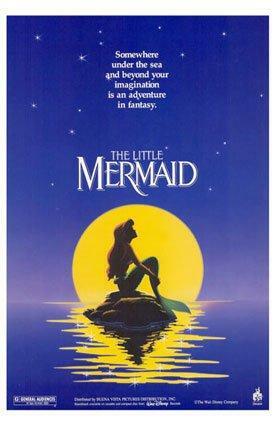 To pay for the transformation, Ariel must give up her voice to the Sea Witch. Once on land, the little mermaid struggles to learn to walk. As she is getting her land-legs, Eric and his dog come down the beach and find her -- Eric has been wandering the beach ever since the shipwreck, hoping to find the girl who saved him. But he doesn't recognize Ariel, and, without her voice, he cannot be convinced that she is the one for whom he has been searching. Nevertheless, he takes the lovely girl back to his castle to care for her. Despite all of her best efforts, and those of Sebastian and Flounder, the evening of the second day passes without Eric's kissing her. But there was a near miss, thwarted only by the intervention of the Sea Witch's lackies. The Sea Witch, knowing that she nearly lost Ariel, decides to take on human form herself, and assumes Ariel's voice. She tricks Eric into thinking that she is the one who saved him, and he insists on immediate marriage. It's the third day, and Ariel is heartbroken and desperate. And then her friend Scuttle overhears the Sea Witch preparing for the wedding ceremony and realizes the trick. He tells Ariel and Sebastian, and they form a plan to stop the wedding. While Flounder gets Ariel to the ship where the wedding is to take place, Scuttle rounds up as many birds and sea creatures as possible to save Ariel and defeat the Sea Witch. Sebastian goes straight to King Triton. The wedding is nearly over when Ariel and the others arrive at the ship. But they stop the ceremony and, in the scuffle, the Sea Witch's necklace is broken. Her necklace is what held Ariel's voice, and, when it breaks, Ariel gets her voice back and is able to tell Eric what has happened. But the third day is over, and Ariel turns back into a mermaid. Ursula grabs her and leaps back into the sea, only to be confronted by Triton. 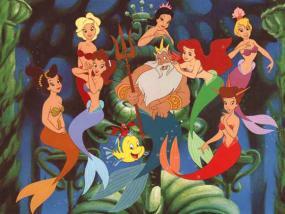 But even Triton cannot break the contract that Ariel signed, and so he agrees to exchange himself for Ariel. The Sea Witch is now supreme ruler of the sea. But she hasn't counted on Ariel's love for her father, or on Eric's love for Ariel. Between them, they defeat the witch and restore Triton to power. When Triton sees how much Ariel loves Eric, he uses his powers to give her permanent human form. An ecstatic Ariel marries Prince Eric, and they live happily ever after.